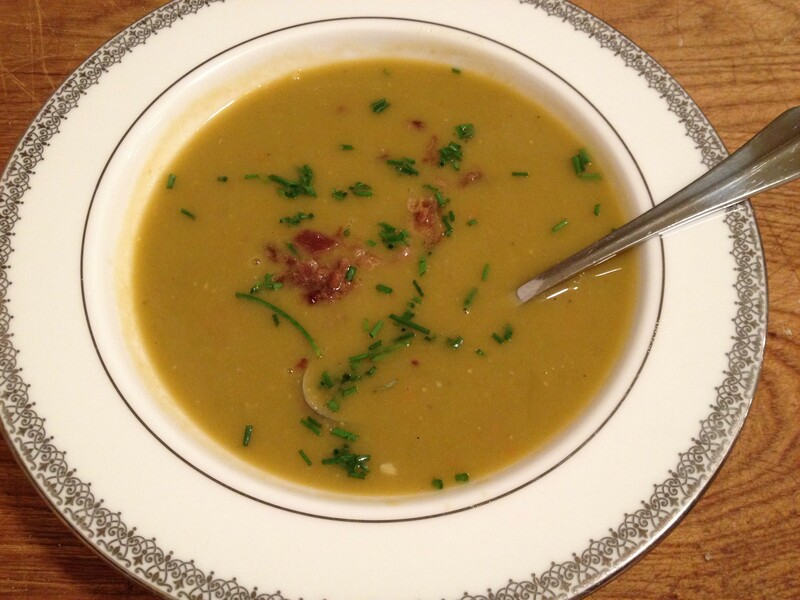 Ahhhh….Split Pea Soup has become one of my faves! Seriously, it tastes amazing and is loaded with nutrients and fiber. It’s also super easy to make, and inexpensive. It has no flaws. The basic recipe is vegetarian and if you so desire you can add ham and/or bacon for extra yummy flavor. Clearly I prefer the extra flavor. Last night my hubby whipped this up and added chopped chives as garnish. I wasn’t sure about the chives and was pleasantly surprised, good job chef! Saute in olive oil – 1 chopped onion, 4 chopped garlic gloves, and 1 chopped carrot. Add 8 cups of water along with 1 lb split peas, ham hock, and 4 pcs cooked crumbled bacon. Bring to a boil and let simmer for 2-3 hrs, stirring occasionally. When peas are soft and broken up remove ham hock. Blend soup mixture with hand-held blender to make smooth and creamy. Dice ham and add back to soup. Enjoy! 06 Oct	This entry was published on October 6, 2014 at 7:59 am. It’s filed under Food and tagged Easy Soup Recipe, Healthy Soup Recipe, Split Pea Soup Recipe. Bookmark the permalink. Follow any comments here with the RSS feed for this post. Cannot wait to try this recipe. Thanks for the delicious idea! We just made this again Sunday and it’s a great winter soup! Hope you like!